Magnolia Verandah: Roasted Corn on the Cob - so simple! 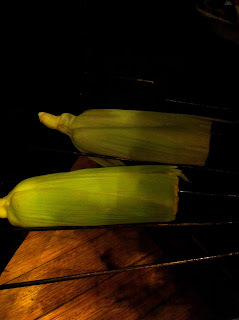 I do buy Corn on the Cob but not often, as I hate preparing it. 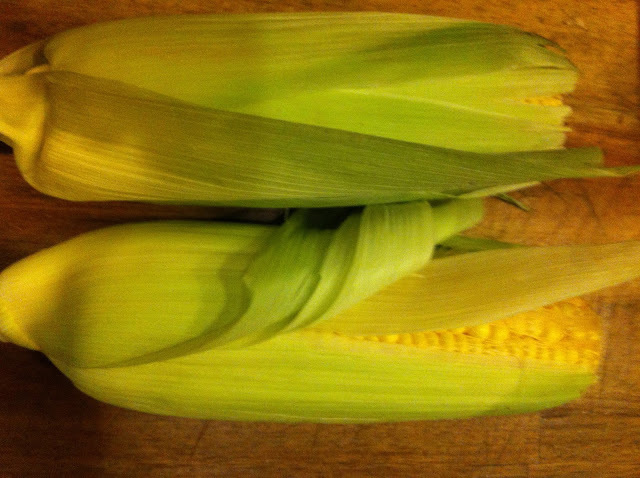 I hate pulling off those silky threads after the outer green sheath has been removed, before dropping it into boiling water, I always boil my corn. I even have a corn boiling pot! For some reason it always makes me impatient, so I either buy pre-prepared in a pack or tinned or frozen. But this week the corn cobs were so cheap I just had to stop and fill my basket. So here is my first attempt at roasting and they turned out perfect and so simple. Wash the outer in case there is dirt, place in a preheated oven (straight on the rack/self) at 180C for 30 minutes and hey presto perfect corn. And the best part is when you peel back the green sheath the silky threads mostly peel away at the same time. How easy was that! And I was perfectly calm! Does anything make you impatient in the kitchen? Perfect in the winter when the oven is generally on cooking our things anyway, and because they don't need a tray you can poke them in any spare space. It was so amazingly simple I will cook it like this all the time now. Shame about the corn pot now. Thank you so much for your comment on the blog about the Bake Off. Funnily enough, I watched the first episode of the Australian version last night, in eager anticipation of the British one next week! It was great fun! Hopefully ill get to see the whole series! Ooh I love corn on the cob it just reminds me so much of summer. Especially with roasted chicken and mashed potoatoes...mmm...my mouth is watering just thinking about it. I've never roasted in the oven before just on a bbq. I must try this method it sounds really simple. 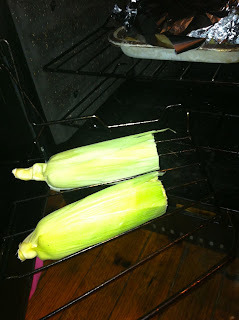 I must say I was pleasantly surprised with this method - I thought the corn may get dry in the oven, but it was as juicy as ever. This makes it super simple! I love roasted corn on the cob. We grew up on it. Roasted corn on the cob with a little lime spread over it and sprinkled with salt. Yum! This will bring back some good memories to share with my son! Oooh lime spread that sounds interesting!